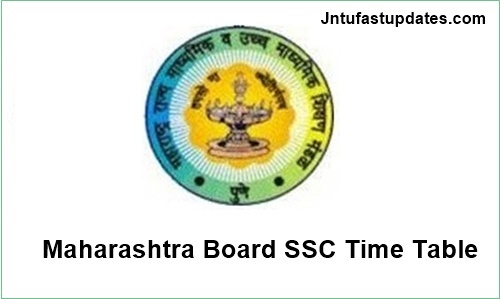 Maharashtra SSC Time Table 2019: Maharashtra State Board of Secondary and Higher Secondary Education (MSBSHSE) has released the SSC/10th class time table 2019 at mahahsscboard.maharashtra.gov.in. As per the date sheet, Maharashtra SSC examinations will be held from 1st March to 22nd March. Students pursuing under Maharashtra education board can check the detailed time table and dates from here below. The timetable will be available on the board’s website – www.mahahsscboard.maharashtra.gov.in and any objections must be sent to the board within 15 days. The Maharashtra State Board of Secondary and Higher Secondary Education (MSBSHSE) annually conducts the SSC and HSC board examinations every year in February/March months. The Maharashtra board is making the complete arrangements to conduct the board examinations without ant malpractices and mishaps. This year the board is going to organise examinations for Secondary School Certificate (SSC) and Higher School Certificate (HSC) classes in March/April months. The MSBSHSE has released the Maharashtra SSC Time Table 2019 and HSC Time Table. Aspirants appearing for 10th class examinations in the Maharashtra state can check the detailed date sheet of theory and practical examinations from here below. The Maharashtra SSC examinations will be held at 2,710 examination centres (approximately). The MSBSHSE 10th examinations will be organized at various locations such as Mumbai, Nasik, Kolhapur, Nagpur, Pune, Aurangabad, Amravati, Latur, and Ratnagiri. The Maharshtra Board will soon start the online application filling for MSBSHSE 10th class examinations. Students can fill up the applications for their academic examinations. This time filling up the Aadhar card number is mandatory while filling up the applications. Hence students can get ready with all the required documents to fill up the Maharashtra SSC exam application form. Please find the more information regarding ssc time table 2019 Maharashtra board below. To download SSC Time Table 2019 pdf of Maharashtra Board, you need to follow the simple steps. Here, we have provided the clear steps to access the SSC Time Table 2019 for old course and revised course students. Go to “latest notification Section” and search for SSC March 2019 Time Table Link. If you find the MSBSHSE 10th Date Sheet Link, then click on it. The Maharashtra SSC Time Table 2019 will display on the screen. Download and Save the Pdf file for feature reference. Take a print out of the SSC Maharashtra time table for your preparation.